Looking For Klamath Falls Jobs? See The Opportunities We Have. If you live in the Basin and have ever been unemployed, you know looking for a job in Klamath Falls can be a challenge. While the rest of the state and the nation seem to be getting out of the unemployment gap, for whatever reason it seems that Klamath Falls has a hard time catching up. And if you do land a job, sometimes you’ll find wages are lower than elsewhere. For a job-hunter that’s looking to provide for a family, that can be frustrating. However, have you ever considered agriculture? 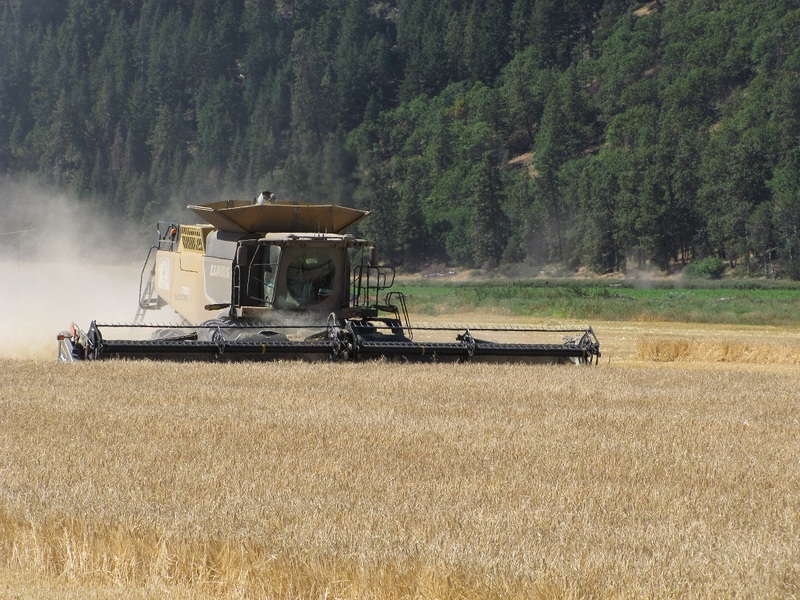 Seriously, as a source for Klamath County jobs, agriculture provides a ton of opportunities not usually given a second thought. And our farm is a prime example of the variety of employment opportunities people don’t consider because we’re a farm and/or we’re not located in Klamath Falls. But if you’re willing to drive a little ways and work hard, you might find ag is right up your alley. For example, on our employment opportunities page, we have listings for not only farm jobs but also mechanic and office positions as well. 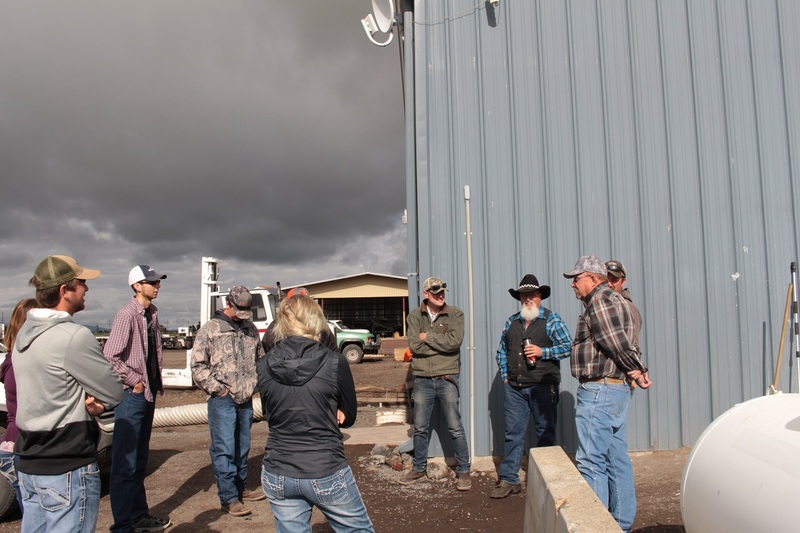 If you’ve read our blog before, you know it takes a lot of people wearing a lot of different hats to keep the modern farm running and successful. Have accounting experience or payroll experience? We need help running payroll and are looking for an experienced Payroll Bookkeeper. And if you’ve ever had the opportunity to process billing and have experience with databases, we’d love to talk to you about our Billing Clerk position. These jobs are located in Malin, and if you’re not familiar with the Klamath Basin that’s about 30 miles out of Klamath Falls. While it may seem like a commute, if you’ve ever lived in a larger city you know that sometimes it can take you that long and you’re only trying to go 10 miles to get home! Perhaps you have a degree in horticulture or agronomy and are looking for an opportunity to make a difference? You should check out our Agronomist job opening. This is a great opportunity for someone who doesn’t want to be stuck in the office or the lab and would love to get their hands in the dirt while helping us grow the Basin’s best wheat, hay and potato crops. Speaking of working with your hands, perhaps you’re more mechanically inclined and love the smell of oil and diesel in the morning. Perfect! We’re always looking for mechanics, and right now we’re looking for a Diesel Mechanic and a Farm Mechanic. These are great opportunities for someone who’s looking to get out of the headache of working for a dealership and loves the idea of turning wrenches and trouble-shooting issues for a wide variety of pickups, tractors and farm equipment. Not a mechanic, don’t want to farm but love shop-life? Then you should see our Assistant Shop Manager job opportunity. Again, not a typical farm job but still a position we need filled to keep our trucks and tractors on the road and in the fields. And all three of these jobs are based in Merrill, which is roughly 20 miles out of Klamath Falls. And if you do want to farm, we have those positions available too! We always need experienced Tractor Operators to help in the spring, summer and fall to help with planting, laying out pipe and harvest. If you’re experienced in leading people and are motivated to succeed, we would love to talk to you about our Hay Farm Manager and Assistant Farm Manager positions. Both of these positions could provide a career with chances for advancement in our companies. Don’t see a job you’re interested in but have skills, experience or education? We’d still love to talk to you. Whether you’re a welder, have an accounting degree or computer networking experience, there may be something on our farm, packing shed or offices that we need your help with. 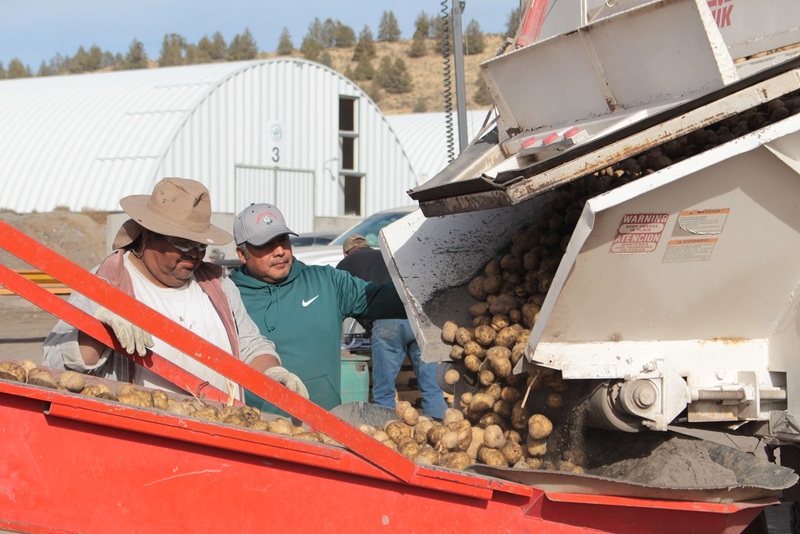 Gold Dust and Walker Farms offers benefits and wages on-par with many of the Klamath Falls job opportunities you see in the paper or online. We pride ourselves on trying to be innovative, which means it takes innovative people from many different walks of life to helps us succeed. While this post may seem like a recruiting push (well, it kinda’ is), we hope our readers can see that it’s also calling attention to how much agriculture and farming has changed over the decades. There’s a lot of non-traditional farming jobs in ag these days. We need someone who’s just as skilled at running a tractor just as much as we need someone who’s skilled at running reports in Excel or Access. Both jobs are important – and keep our farm going. If you’re ready for a change of pace or a new opportunity, let’s talk. Yesterday, December 20th, Gold Dust held its annual office Christmas party at Bill and Jan’s house just north of our campus. The atmosphere was merry and there was lots of laughs and cheer over the white elephant gift exchange. Good food, good times and great people always make the holidays a special time of year! While on the topic of great people, Gold Dust and Walker Farms are blessed to work with the most generous folks. If you look through our farm’s blog, you’ll find post after post about giving and donating. This year alone our companies and the people who help us succeed raised $31,000 and 135,000 airline miles for Make-A-Wish Oregon. So, it goes without saying that when the holidays roll around, we also experience the generosity of the people coming and going from our packing shed. Merry Christmas and Happy New Year from Gold Dust and Walker Farms! Salvador and his “prize” – a goldfish for his office! Years past, we’ve held food drives for the Klamath and Lake County Food Bank and adopted a family for Christmas. More recently, we’ve been holding toy drives for our local Toys For Tots. 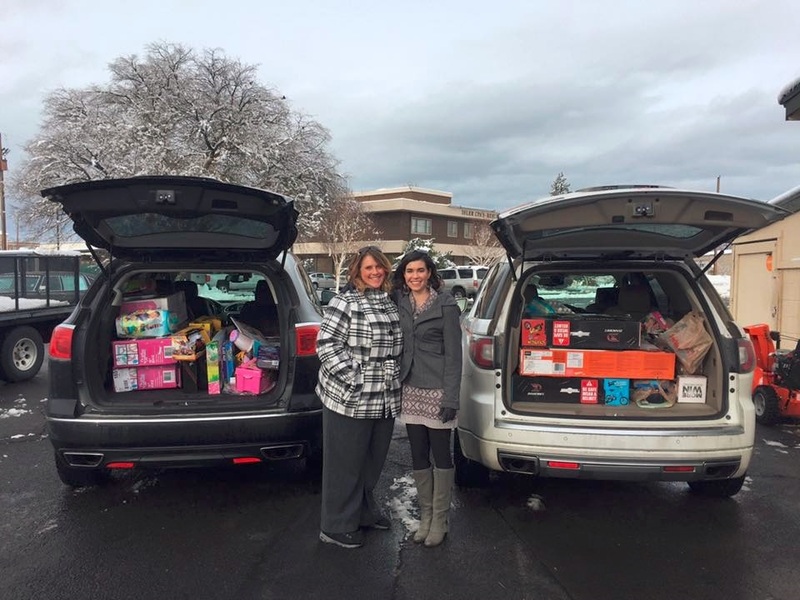 For example, last year between what our employees donated and what the company matched, we were able to fill the back of Tricia AND Lexi’s SUVs! This year, with Nayeli Pena leading the charge, we held another successful toy drive for Toys For Tots. And this year was amazing! As usual, our farm, shed and office crews contributed with toys and cash. Truck drivers that work for the various carriers that deliver our chipping potatoes and hay to our customers also contributed. Then our growers stepped up, with Luke Robison’s family donating $500. Our office was filled with toys and bicycles, and the cash donation bucket was filled with a variety of bills. Overall, 25 toys, four bicycles and around $1,000 was donated by the incredibly generous people we work and do business with. And yes, Gold Dust and Walker Farms matched it! On Tuesday, December 19th, Tricia and her husband made the trek to Fred Meyers in Klamath Falls to fulfill Gold Dust’s end of the bargain. Fred Meyer’s manager also stepped up, offering discounts to help our contributions go even further. In the end, we were able to drop off 161 gifts to the Klamath Falls Toys For Tots. That donation was very much needed. When dropping off the gifts, one of the Toys For Tots volunteers told Tricia that this year they were trying to provide gifts for 2,000 local kids – 500 more than they expected. When you consider how many households are in the Klamath Basin, that’s a lot of families that are affected. 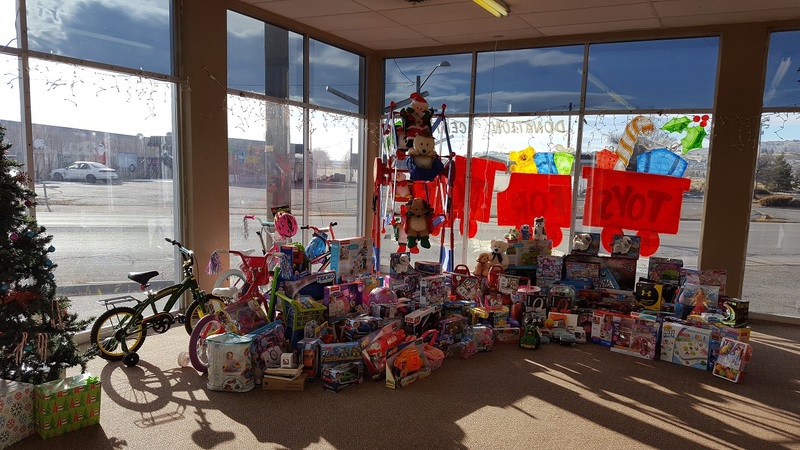 All the donations to the Klamath Falls Toys For Tots program stay local – which means when you give a gift in our community, it stays in our community. Suzanne Wallace helping load one of our donations of potatoes. Photo credit Lexi Crawford. Along with Toys For Tots, we also donated truck loads of potatoes to area charity groups and organizations. Those groups included Integral Youth Services, Women Infant Health, Malin City Hall, Tulelake-Newell Family Center, Klamath KID Center, Klamath Lake Community Actions, Henley High School FFA, Bonanza High School FFA, Bonanza Community Church, Livingsprings Church, Klamath Senior Center, Faith Tabernacle Church and Marta’s House in Klamath Falls. All of these organizations give back to community and we’re happy that we’re able to help them with their causes during the holidays. We are proud of our employees and the people we do business with and the amount of generosity they showed with this year’s giving. Though we focused our holiday giving on our local Toys For Tots, there are lots of other ways to help. Consider those 2,000 children – their families likely also need help providing food, paying the power bill and more. Whether you slip something into one of the Salvation Army’s red kettles or take canned food to the Klamath-Lake Counties Food Bank (you can donate online too! ), every little bit helps someone in our community. Before we wrap this up and wish everyone a Merry Christmas and a blessed New Year, we’d like to give Nayeli a big thank you for her work on this. We’d also like to thank Luke Robison’s family for their generous donation and to thank everyone who donated cash or toys. We’d also like say thank you to the Fred Meyer’s managers and cashier who helped make our donations go further. And of course, thank you to Toys For Tots for providing the spirit of Christmas to kids in our community. When you think about our company slogan, “where together we grow”, it’s evident that it extends beyond our sheds and farm and into the community as well. It’s part of what makes the Klamath Basin a great place to live. And now, may everyone have a happy and safe holiday season and here’s to an amazing 2018! KCC Ag Marketing Class Visits Gold Dust & Walker Farms! As one of the most dynamic farms in the Klamath Basin, from time to time we get to share what we do with local schools. These field trips (some of them are literally out to fields) give us an opportunity share our love for farming with the community and expose young minds to agriculture. On June 1st, we had another such opportunity, but this time it was a bit different. 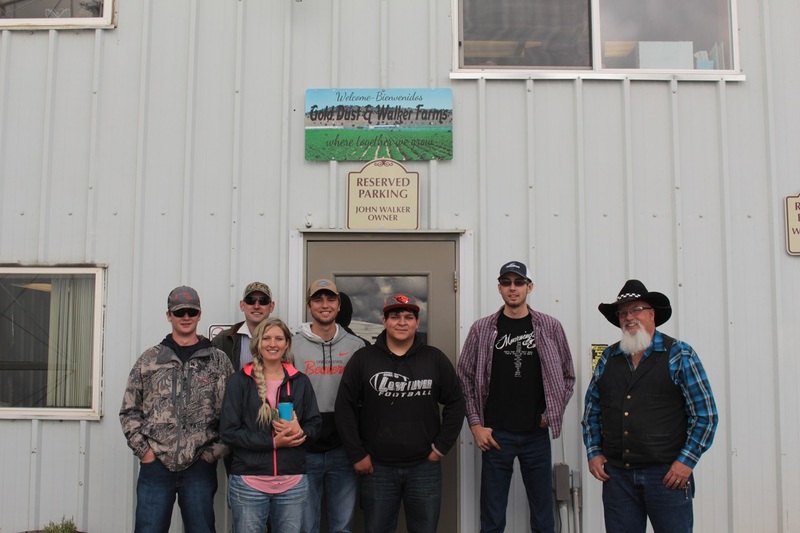 Instead of grade-schoolers, Professor Keith Duran brought his ARE 221 Agriculture Marketing class from Klamath Community College to learn more about what Gold Dust and Walker Farms do and what it takes to be successful in agri-business. Their visit started at 8:30 in the morning at our Merrill shop, where John Walker and Bart Crawford met with the class. Though the conversation started out discussing what it takes to produce an organic crop, it quickly turned what it takes to actually run a farm. John talked about the amount of time and support it takes to ensure your employees have what they need to be able to be successful in their tasks. Adding to it, Mr Duran recommended his students to “Be a border collie, not a pit bull”, that leadership is more than hovering over your workers. Before our guests headed to Malin for the second part of the field trip, John left them with one more piece of advice. “Always remember one thing – it’s logic. It’s all logic,” he said, going on to explain that most of the problems, whether with the crops or equipment, can be figured out by stopping and thinking. Upon arriving at Gold Dust’s Malin campus, the KCC students were given a tour of our potato processing plant by Walker Brothers employee and ARE 221 student John-Rian Watson. 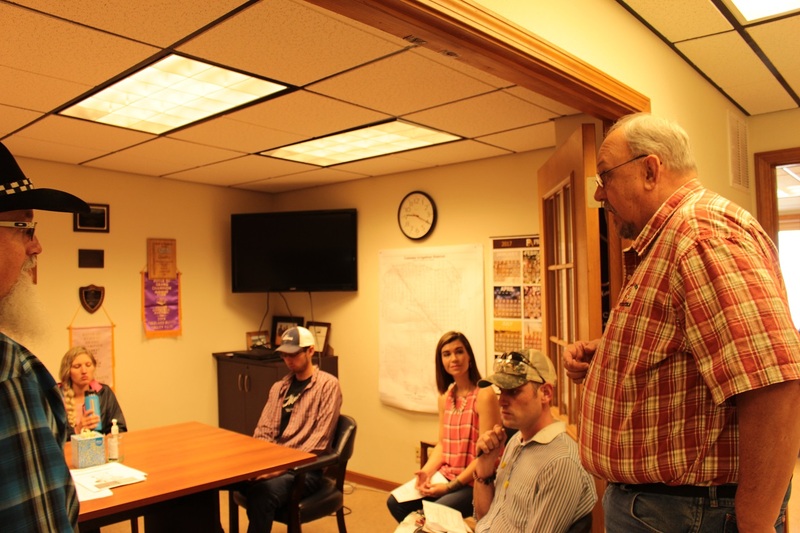 After the shed tour, they met with Bill Walker and Lexi Crawford in the conference room, where, along with a discussion about the potato markets, our CEO gave them more advice on how to succeed at Gold Dust and in agri-business. While recommending the students need to pay attention to detail and possess a desire to work, he stressed it was important for the students to finish their schooling. “A college education does matter, “ he said, pointing out that it shows they can follow-through with what they started and complete tasks. Lexi also spent some time talking about the potato market and what it takes to provide excellent customer service, but when asked about her background, the conversation turned into what it takes to run a modern farm. Without a background in agriculture, the Albany-native’s family business was engineering, not farming. However, the advice of her family to study business, a chance meeting with Weston Walker and marrying Bart (who is also from a Basin ag family) led her down a winding path to Gold Dust and Walker Farms. Her education and experience has more than helped make her a key player in our marketing and farming operations. Lexi and the Agriculture Marketing students shifted their talk to about how the next generation of farmers is changing – as well as the opportunities today’s farms offer. A problem our local farms and ranches have is young people are leaving and not coming back. One of the students, Victoria Flowers, is a part of a solution. 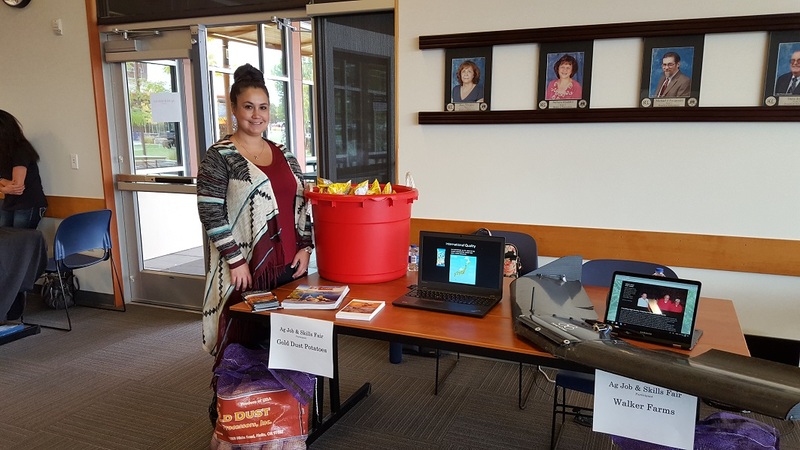 She’s helping to establish Junior Farm Bureau at KCC to help educate area students about the future of Basin ag and job possibilities it offers. If the enthusiasm of the Ag Marketing class are any indicator, there’s a good chance we may be able to reverse this trend. 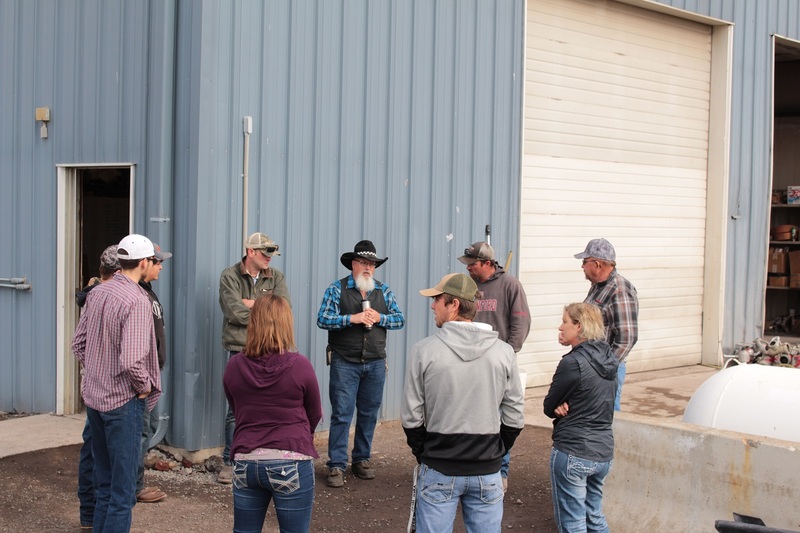 For Gold Dust and Walker Farms, one of the most important aspects of Professor Duren and his class’s visit it that we got an opportunity to show the next generation of farmers and ranchers the possibilities available in ag. We appreciated them visiting our shop in Merrill and shed in Malin to see what we do, and hope it was educational for them as well! Thank you again for coming out visiting us! The Chipping Potatoes Are (finally) In The Ground! Our busy season has gotten a little less busy. 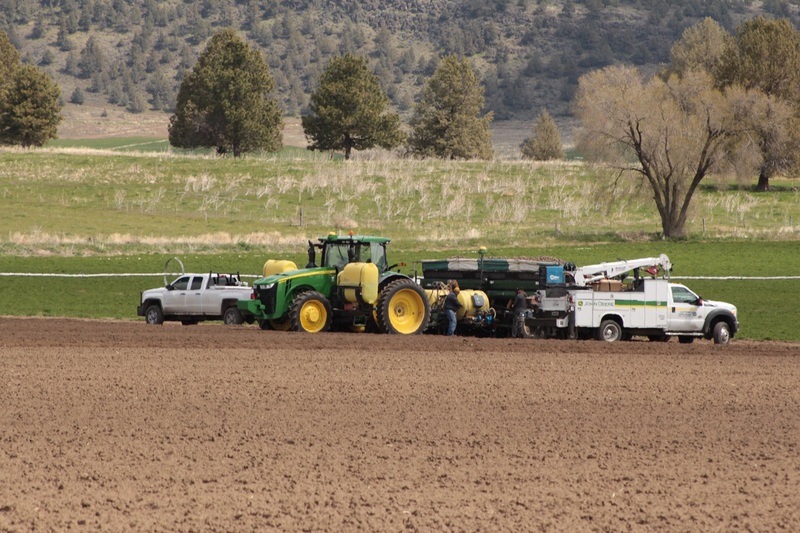 Last week, on June 2nd, we wrapped up planting potatoes in a seed potato field down on the Oregon-California border near Worden. Slightly breezy and warm with a view of the Klamath Wildlife Refuge and the snowcapped Siskiyou Mountains to the south and rolling hills and Cascades to the North made for a serene ending to a challenging season. That chipping potato seed field is looking good! Every potato planting season comes with its challenges, and this one was no different. The wet winter and spring were a blessing and a curse –a blessing for the much needed end to the drought we’ve been living with but a curse as it kept us from the fields for a while. Once we were able to get out to the fields to plant potatoes, modern technology’s gremlins decided to play a few tricks on our planters and tractors, slowing our planting crews to a crawl in the beginning. Despite that slow down, we chased them off and did what we do best – farm. Like shipping potatoes to our customers, planting chipping potatoes takes more people and effort than a lot of folks realize. The story of planting season begins before the seed even hits our cellars, up in the offices of Gold Dust’s Malin campus. In the months leading up before the seed arrives, our management team has to figure how many acres are going to be planted into chipping potatoes and which varieties we’re going to grow. After those decisions are hammered out, the potato seed has to be ordered and we have to plan for it to be stored once it arrives. Since we’re in the heat of shipping season at this point, there’s a dance between emptying cellars and getting them cleaned and getting our customers’ orders through the packing shed. 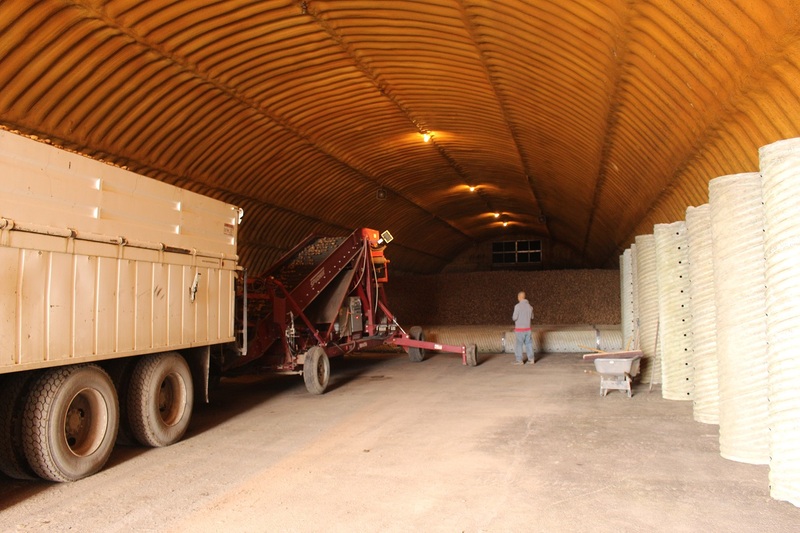 It takes an extraordinary amount of coordination and organization between the shed crews and the cellar crews, yet they manage to make sure we have room for the incoming potato seed while getting our customers’ orders out on time. 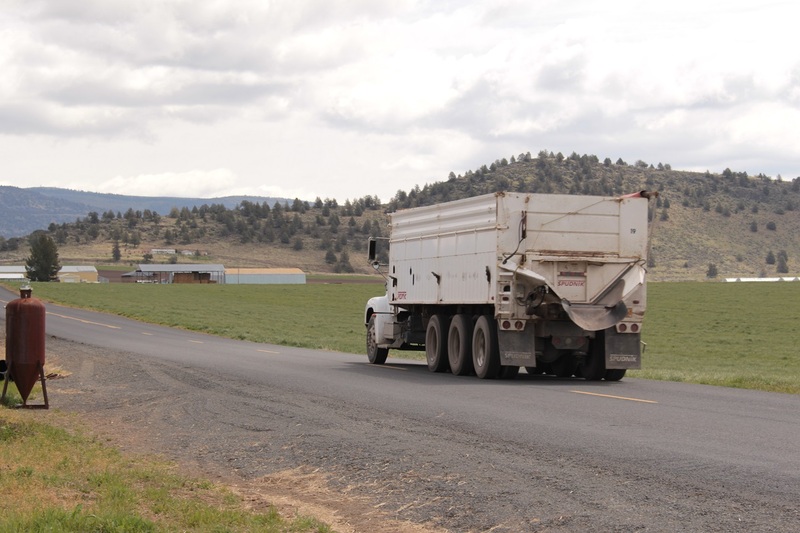 While some of the potato seed we plant is grown right here in the Klamath Basin, much of it comes from out of state and arrives by truck and rail. For the seed that comes by train, we have crews at the rail yard in Malin unloading it from boxcars into spud trucks. The seed that comes in on trucks requires a slightly less handling but still quite a bit of coordination as, we mentioned, we’re still in the middle of shipping season and it takes people to get it unloaded. Regardless of how it gets to Malin, the seed still needs to get weighed before going into storage, which means our front office crew is watching the scale and creating weight tickets. So, when it’s time to plant potatoes, we just throw them in the planter and stick it in the ground, right? Nope. We set up a cellar to process and cut the seed, bark it (yes, with bark dust), which in and of itself takes a lot of hard-working people to make sure we’re putting high-quality product into the ground. After the potato seed is cut and barked, it goes back into storage for a few weeks until we’re ready to plant it. It may only take a few paragraphs to describe getting ready for planting season, but it takes months of hard work and organization to make sure when we’re finally able to plant potatoes, we’re ready to go. And when it’s go time, it’s another dance of equipment and crews. Just as our management team figures out which fields will be planted with which potato varieties, they also figure out when they’ll be planted. Back in the offices, the battle plan is sorted out, the bookkeeping team is tracking the seed as it leaves the cellars and the front office is back to tracking the weights of loaded spud trucks as the truck drivers head out to the fields. Speaking of the fields, it too is more complicated than dragging our equipment out and putting seed in the ground. In most cases the field is transitioning from a cover crop or one of our rotational crops (as per our sustainable farming plan) to a potato field. This requires weeks of tilling and working the ground over so we can plant potatoes in them. Prepping the fields often starts while the end of winter is lurking about, which means being at the mercy of the weather for when we can get our tractors out into the fields and pray they don’t get stuck. And then once the fields are ready? We’re still watching the evening weather reports and tracking the storms and the sun to see when we can actually get the spuds in the ground. Now that the time is right, get that potato seed out in the field! And when all the planning comes together, the coordinating of the various crews is worked out and the weather is just right, then – just then! – we’re able to plant our chipping potato crop for the upcoming year. And again, as with everything in agriculture, it takes more people than just the guys in the tractors to get the fields planted. 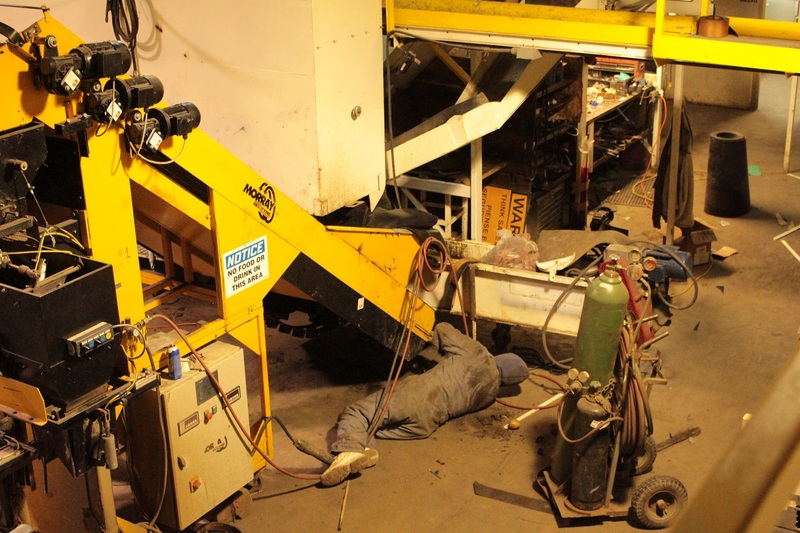 We have our mechanics on hand fixing everything from pickups and spud trucks to the equipment. Our spud truck drivers are getting the potato seed to the planters and our agronomy team is checking the seed, ground and conditions as the fields are planted. Our management team is warily watching the process in the fields and from the offices to make sure everything is going as planned while our field crews are laying out pipe in the fields that have just been planted. Everyone is pulling together, diligently doing their job – regardless of how unrelated they seem to each other – to make sure the potatoes are planted. In a few weeks after the potato seed is in the ground, we begin to see the fruit of all this organization, labor and worry as potato plants sprout from the ground. Because planting season is over doesn’t mean the worry and hard-work is over, it’s just a different season. Frost crews will be monitoring the bitter nights, preparing to turn on sprinklers to fight the cold. Our irrigation teams will be making sure the potatoes get the water they need while the agronomy team is watching the plants for signs of stress and pests. The marketing and sales team will be lining up customers’ orders while the management team is looking toward harvest and beyond. When you consider all of the different people involved in planting a potato field and all of the different hats being worn it takes to make it happen, it’s really incredible. It also showcases the variety of jobs available on the modern farm – we need all of these people doing these different jobs well just to get a potato in the ground! Thank you to our hard-working planting crews who gave up weekends and worked late into the nights to make sure the fields were planted this year. And thank you to everyone – from the shed and cellar crews to the office staff and truck drivers – for getting the potato crop in the ground. Your dedication is much appreciated. And now, we can turn to planting grain and cutting hay! 2016-17 Potato Shipping Season Is Over! During shipping season, this driveway was packed with semis waiting to be loaded with chipping potatoes. Another shipping season has come to an end. Normally humming with the din of machinery, forklifts and conveyor belts, the inside of the great white packing shed is all but silent. Except for the comings and goings of spud trucks hauling chipping potato seed to the fields and the haying equipment parked in the field, the driveway is all but empty. How long did shipping last this season? On July 12th (2016), we started shipping potatoes from Boardman, OR, which lasted up until August 25th. As shipping from up north slowed, we fired up our processing plant on August 23rd. If you think about the timing, that’s when we started potato harvest, not to mention we likely had alfalfa being bailed and grain being cut as well. As you can see, then end of August tends to be an incredibly busy time of year for us! 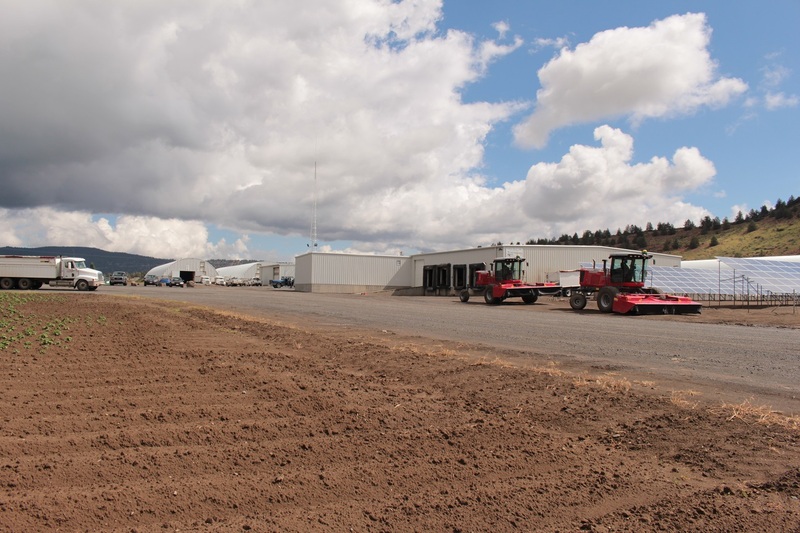 Though, it was only slightly less busy when we stopped shipping on May 16th – spring farming was well under way with planting grain and chipping potatoes as well as getting ready for our first cutting of alfalfa hay. In that time, we shipped chipping potatoes to customers in Arizona, California, Oregon and Nevada. When we mention we’re an international company, we’re not kidding. Last shipping season we sent spuds to Costa Rica, Guatemala, South Korea, Malaysia, Philippines and Japan. We also crossed the 500 days with no time-loss injuries in the packing shed, which in and of itself is impressive as well! It’s pretty amazing to consider how many chipping potatoes passed through our plant, the places they were shipped to and the things that happened around the shed in those 10 months. While looking into those details can be fun, there’s a story behind them that isn’t often told. The key to no mechanical failure down-time is properly maintained equipment. a lot of diligent, hardworking people behind the scenes that help make Gold Dust look good. For example, for a packing shed to efficiently and effectively run for 10 months, it requires someone making sure our equipment is in good shape and repairs, when needed, are performed as quickly as possible. According to plant manager Matt Thompson, the only days the shed was shut down were on Thanksgiving and Christmas Day. There were zero down days due to mechanical issues, which if you look around our shed and see how much equipment there is, that’s incredible! To get the chipping potatoes into the shed, you have to have a cellar crew that loads our spud trucks, plus all of the drivers that haul the chippers from storage to the plant. 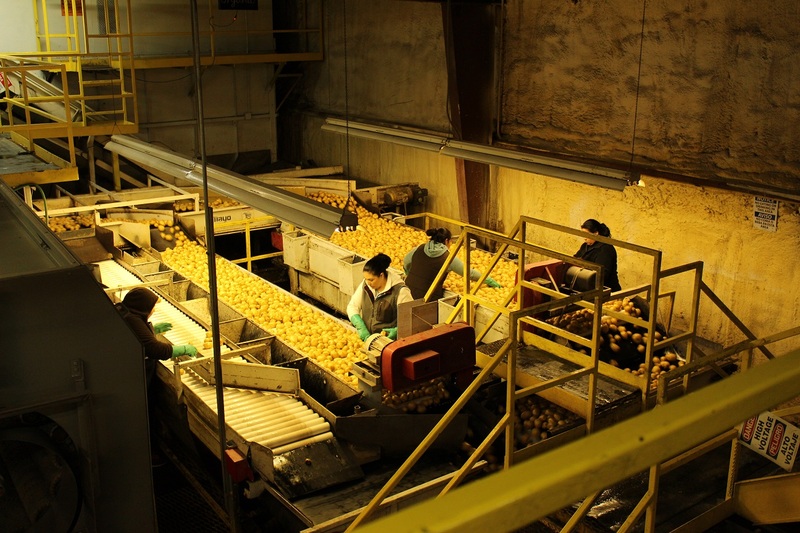 Once they arrive at our plant, there are people making sure the potatoes are cleaned to the customers’ requirements, not to mention the crews on the lines that are manually inspecting potatoes for defects that are occasionally missed by our sorting equipment. After the potatoes are sorted there’s another crew that packages them and then loads them in the trucks. 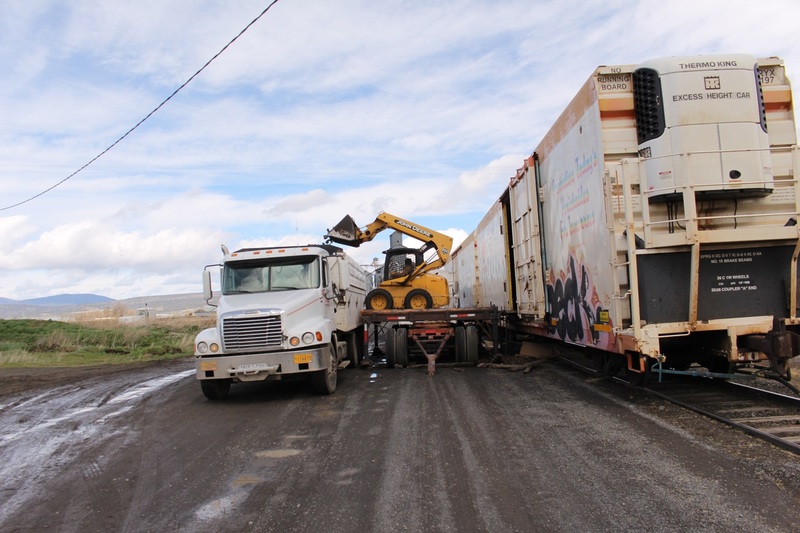 As you can see, it takes a lot of people just to get the potatoes from the cellars to the trucks – but we’re still not done! In the front office, our staff not only greets customers and answers the phones, but they also weigh the potato trucks before they unload. We also have employees who help broker the loads and, if needed, help work on the arrangements to get the orders loaded onto boats headed overseas and deal with the various customs laws abroad. It also requires diligent people to make sure the orders as well as the freight are billed correctly. 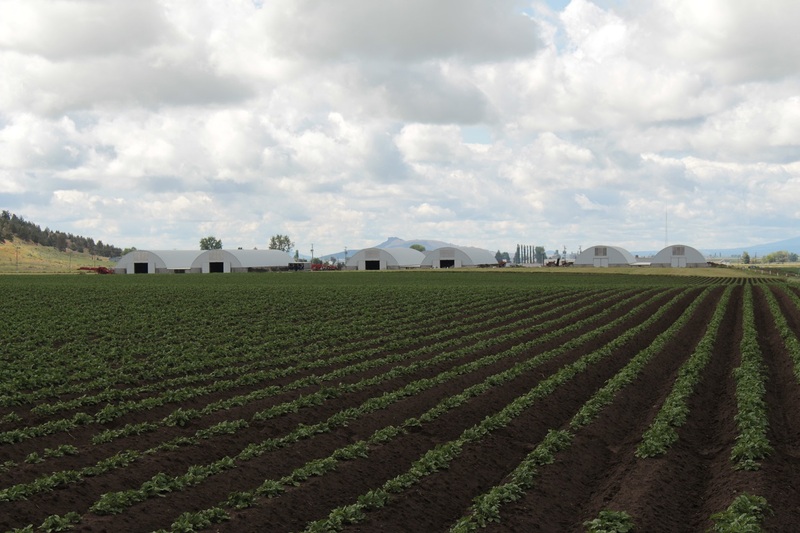 Not to mention quality control people to make sure our chipping potatoes are meeting our high standards, a human resources department to make sure our employees’ concerns are met, and people making sure our employees get paid on time as well as our growers and vendors. We also have the marketing team which not only tries to increase sales but also give our customers the service and attention they deserve. And last, but certainly not least, is the management team that makes sure all of the work gets done so we can continue to grow and ship chipping potatoes! The shed during busy times . . . .
. . . . and during less-busy times. Speaking of growing potatoes, we also have to give credit to the farm crews who put in the long hours during planting season and harvest as well as watch over our fields during the growing season to make sure they’re getting the right amount of water and the pests aren’t hindering growth. If Walker Farms’ crews didn’t work hard growing an amazing crop of conventional and organic chipping potatoes, frankly we wouldn’t be here. Sometimes in agriculture, we take for granted how many people and hours it takes to produce a crop. Too often the thought of farming is condensed down to a simple image of a guy on a tractor. There is some truth in that icon – it does take a guy (or gal) on a tractor to get the crop in the ground and out again. But it also takes a lot of other people doing their job – in the office, in the shed, in the truck, in the cellars – to help feed America and the world. And as we reflect on the end of shipping season, we feel we need to give all the hard workers in our shed, offices and on our farm the credit they deserve. We’ve said it many times, but it’s still true: We have the best crews in the Basin, and if it wasn’t for their attention, dedication and determined employees, we wouldn’t be here. 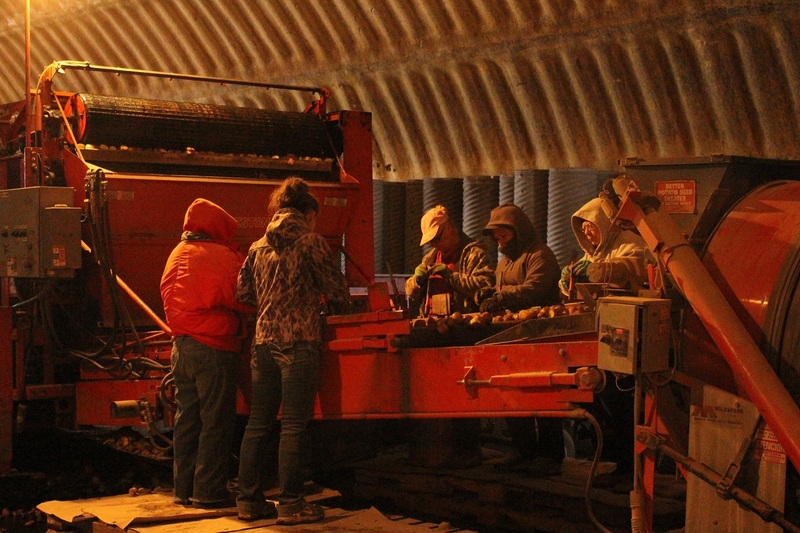 Our hard-working sorting crew helping provide high-quality chipping potatoes. Thank you to everyone for their time and commitment to Gold Dust and Walker Farms. And here’s to a great growing season! There’s snow in the Klamath Basin! In time for the holidays, snow has covered the Basin. Aside from the peacefulness created by the white blanket, hopes of a good water-year are filling everyone who lives here with optimism. 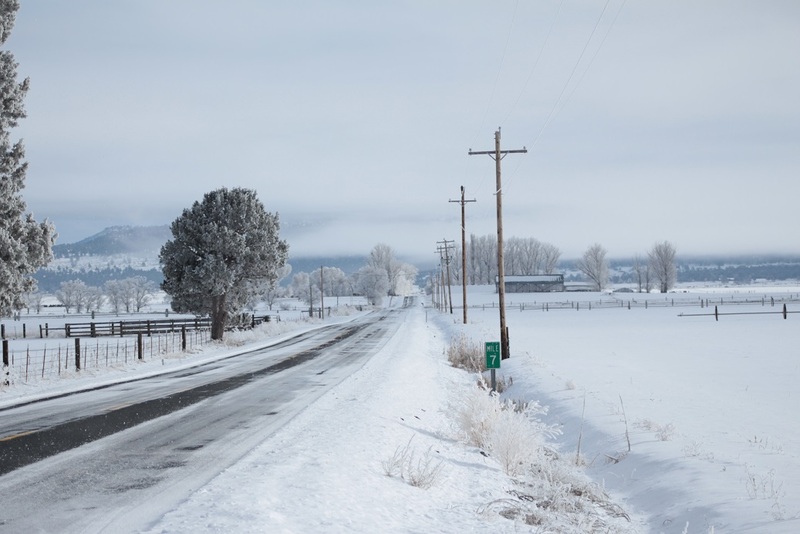 After the years of drought, a true white Christmas with fresh snow brings with it the anticipation of a bright – and wet – 2016. This time of year brings with it office parties and celebrations of all sorts, and it’s the same for Gold Dust and Walker Brothers. For the past four years, some time between Thanksgiving and Christmas, the companies’ partners invite the managers and most important employees to dinner to discuss the current state of the businesses, where they see things going and to recognize three people who are doing an outstanding job. 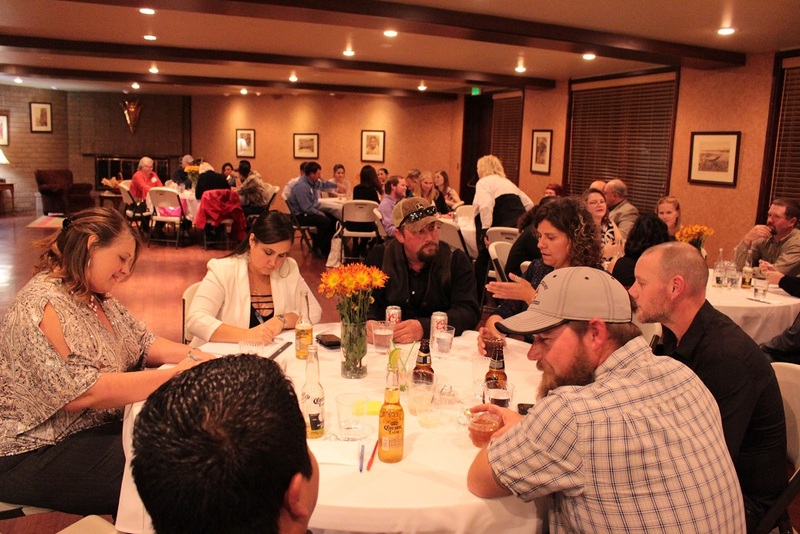 This year, the Leadership Dinner was held December 5th at Mr. B’s in Klamath Falls. After appetizers and mingling over drinks, Bill and John welcomed the guests and discussed how building relationships is helping Walker Brothers and Gold Dust succeed. Tricia and Weston followed them with the changes the company made over the past year, some of the challenges the farm and businesses faced, discussed what had been successfully implemented from last year’s Leadership Dinner and welcomed ideas for the upcoming year. This is a good-looking bunch of people! Following dinner, the Top 3 Leaders of 2015 were presented by Weston and Tricia. Though she was home with a sick child that night, Nayeli Pena was recognized for her leadership in the office. For those not familiar with Nayeli’s history with Gold Dust, she started off on the packing shed floor sorting potatoes and worked her way into the front office. Showing an incredible work ethic and attention to detail, Tricia and Bill constantly asked her to come work upstairs until she finally said yes, where she continues to shine. Weston and Lexi presented Toby Turner with an award for Outstanding Farm Manager. Toby started with Walker Brothers as an equipment operator and over the last few summers has stepped up and helped Weston grow the hay farm. Not only does he help with growing and haying the alfalfa, he helps with loading trucks, keeping an eye on the hay inventory with the Gold Dust office staff – earning him the role of Hay Farm Manager. The final leader recognized was Matt Thompson. Bill and John talked about when Matt started with the company, unsure if he’d make it through a summer of farm work. But he made it through that summer, and with Salvador, puts in the long hours during shipping season to manage the packing shed and it’s crew, earning him the nick-name “Little Bill”. Since Christmas is a major part of the season, this time of year also brings with the annual Gold Dust toy drive. From November through December, Gold Dust sets up a jar for donations and encourages employees to donate toys for the local Toys for Tots program. For every toy donated, Gold Dust matches the gift. 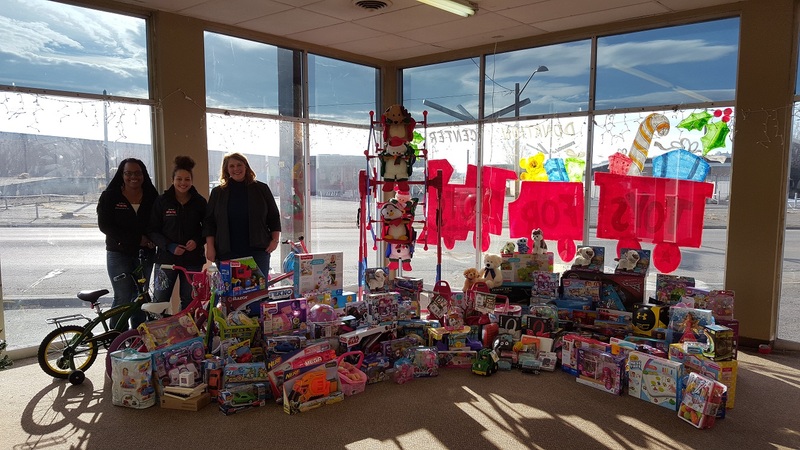 This year, Gold Dust and its employees raised $216 and as a group donated over 60 toys! With the help of these two elves . . . Turned into this! Well done, Gold Dust crew! Keeping in the Christmas spirit, Gold Dust’s office staff upheld their annual ugly sweater contest, desk decorating contest and secret Santa exchange. 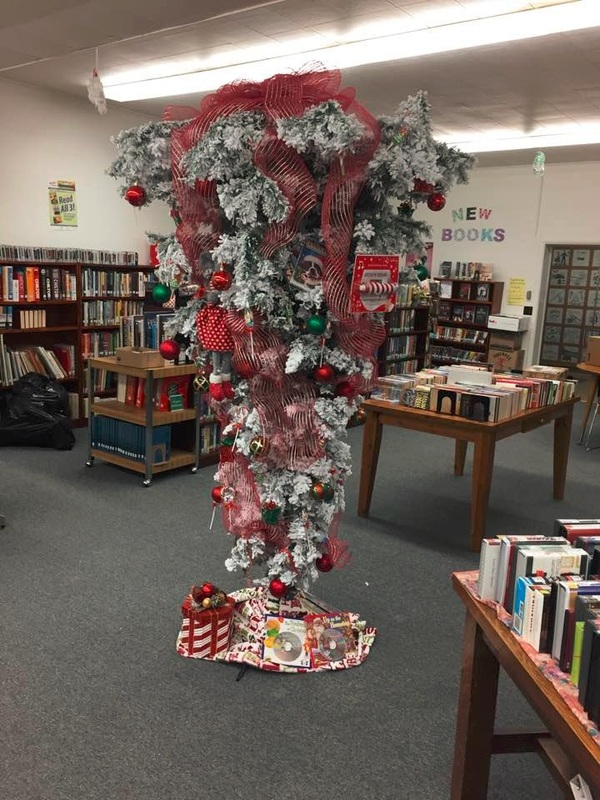 This year, Santos Flores took home, ahem, “top” honors for his sweater of choice while Rich and Jeanne teamed up for the best decorated office! Whatever it is, everyone is excited to see what Danielle got! Santos won, but from what I can tell not by much! Looks great, Rich and Jeanne! Another annual holiday tradition is the Holiday Luncheon held at our packing shed. 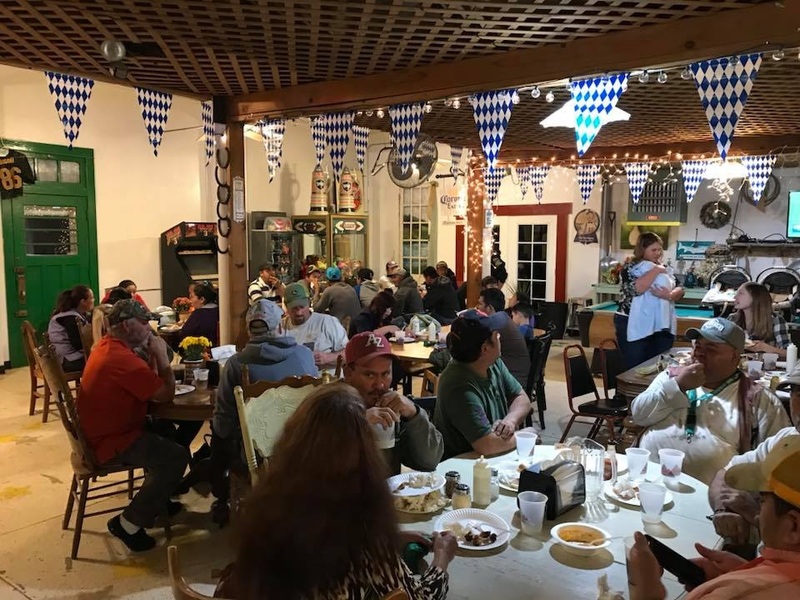 For lunch, Santos arranged for Gold Dust and Walker Brothers employees to gather on the packing shed floor for a catered lunch from Tacos Ala Mexicana of Merrill. Among the Christmas trees made from old pallets, our crews visited while munching on enchiladas and tacos. After Bill, Tricia and Weston thanked everyone for their hard work – and their generosity for the toy drive! – cake was served. Thanks for setting up the Holiday Luncheon, Santos! Tricia’s daughters Mari and Rory joined the staff for lunch and cake! While this time of year always brings out the charity in everyone, Gold Dust would like to encourage giving year-round. One of the ways we try to help is by getting food to our local food bank. 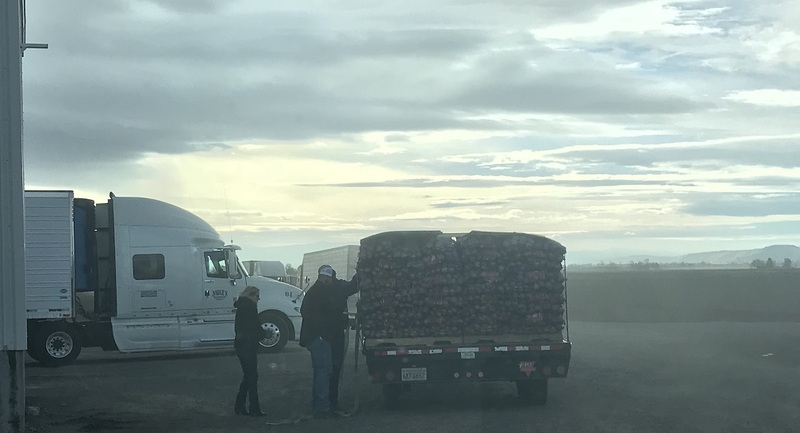 Aside from donating potatoes, with the help of Rich Wright, our trucking dispatcher and broker, we also facilitate the moving of food items for the Southern Oregon Outreach Foundation and the Klamath Lake County Food Bank. While we have trucks and someone with a big heart to help us help these organizations throughout the year, we all can find ways to help out in our community so the holiday spirit lasts throughout the year. Even if you don’t want to give money or donate food, there are a lot of creative ways to give back, and even giving your time to these organizations helps make a difference. It’s been quite a year, and we couldn’t have had as good of one if it weren’t for our amazing employees. Thank you all for your hard work and dedication to our companies. We hope everybody had a wonderful Christmas with their families. And here’s to a fantastic 2016! 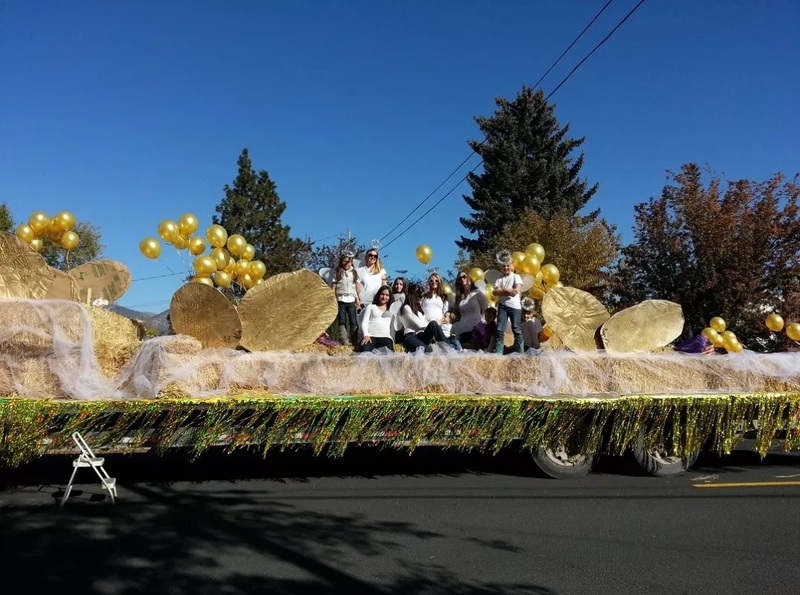 The Klamath Basin Potato Festival is a tradition that brings folks from all over the Klamath Basin to Merrill to celebrate the area’s most popular tuber. If you grew up in the rural Klamath Basin, the Potato Festival likely served as your social backdrop to the ag community. With the crowning of the Potato Festival Queen, the Spud Bowl football games, the Saturday parade followed by a free potato feed, it’s a tradition that we’re happy and proud to be a part of. And every year, the Potato Festival seems to get bigger. 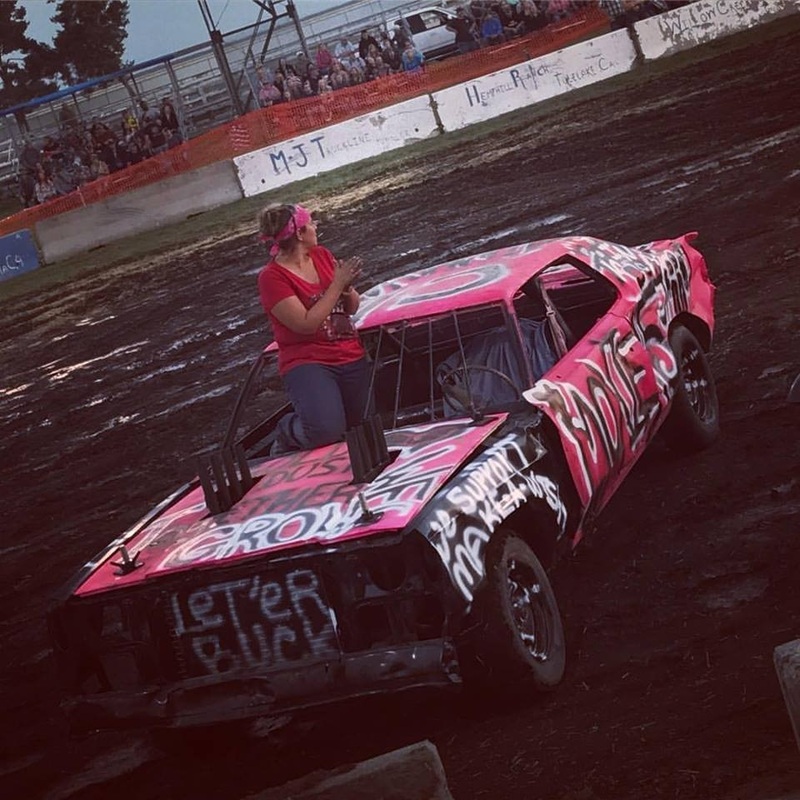 Bigger floats, more parade entries, food carts from around the area, the addition of Pop Warner football games, bed races and now a car show – there is almost literally something for everyone. Against the backdrop of the Spud Festival, Gold Dust has created a few annual traditions of its own. One of those traditions is on the Friday of the Potato Festival, the Gold Dust Staff gets together for a potato lunch. This year, Jan Walker invited the office staff up to her home to dress up baked chipping potatoes (yes, you can bake ’em!) for lunch. From chili and cheese sauce to bacon and jalepeños and everything in between, everyone brought something to top their spud with. Not only was it a great way for the staff to get out of the office and hang out together, it was delicious! C’mon, guys! It’s tater time! There’s a lot of toppings to put away! Another tradition that has developed over the past couple of years is Bring Your Kid to Work day. Between Potato Festival Friday usually being a teacher’s in-service day and the afternoon of it being dedicated to working on the parade float, the office staff has been bringing their children to work to help out. This year was a little different than years past in that the kids were treated to tours of the packing shed as well as the cellars. “We’re always giving tours to other people and school children,” said Tricia Hill. 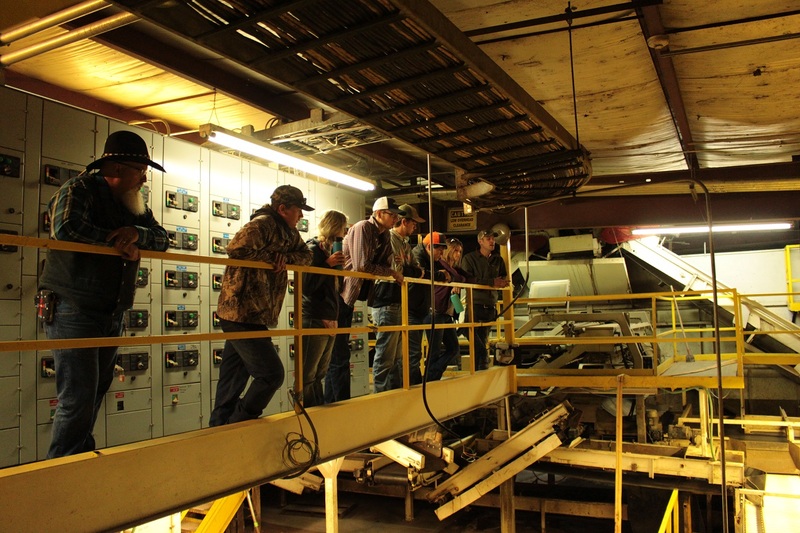 “So this year, Lexi and I decided we should give the kids of the people who work here a tour so they can see what happens where their moms and dads work.” Out of everything the children saw, it seems the big pile of spuds and the plenum made the cellars a clear winner. It’s long climb to the top of that hill of chipping potatoes! Rory even gave a shed tour! And of course, it wouldn’t be a Potato Festival without a float! This year, the festival’s theme was “Spud-Tacular”, and there were plenty of “spudtacular” entries. 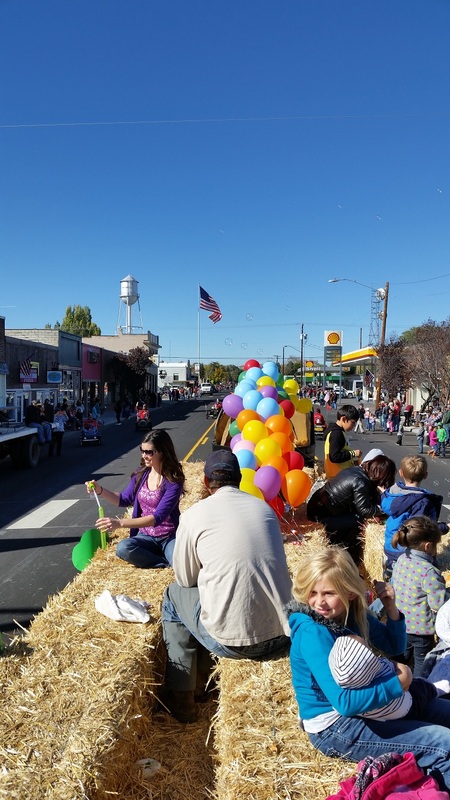 Gold Dust and Walker Brothers’ float was pulled by one of our International Express trucks and featured a balloon rainbow leading to a pot of golden chipping potatoes. A few Gold Dust and Walker Brothers folks showed up to help decorate the float Saturday morning, and their dedication nabbed us first place in the Commercial Division of the parade! Well done! Hang on to those balloons! Now THIS is a winning team! Good job! Madison, welcome to your very first Potato Festival! 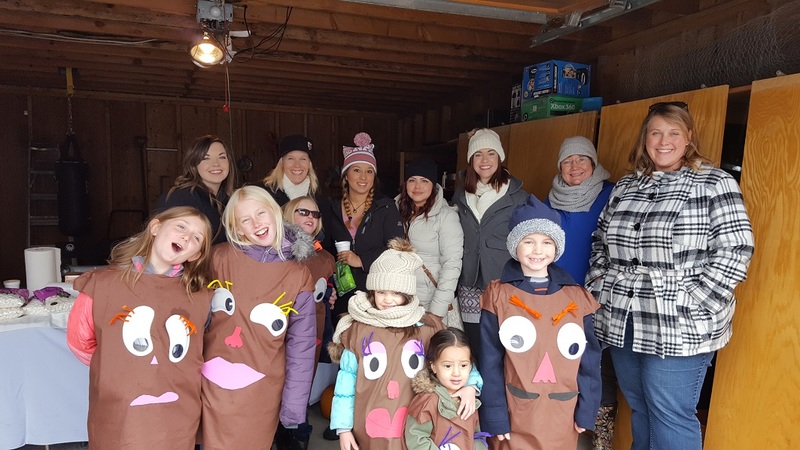 Before wrapping up this post, we’d like to give a big thanks to Jan Walker for putting on the potato feast in her home, as well as to the Gold Dust staff for planning and putting together the float. It turned out great, and thanks to your dedication we’re able to show our involvement in the community. See you all next Potato Festival!